In C.S Lewis’ Chronicles of Narnia series, the imaginary land of Narnia is initially set in a very peculiar way. The wicked White Witch has taken over the land and put a spell on it, squelching the once-beautiful green pastures and forests under a thick blanket of snow. As Lucy enters into Narnia via that mysterious wardrobe, the first Narnian she meets is the faun, Mr. Tumnus. Mr. Tumnus begins to explain the dire situation in Narnia, telling Lucy that it’s “always winter, but never Christmas.” In typical Lewis fashion, he vividly describes the despair the poor Narnian’s felt in words we can all understand. Winter without Christmas? Always? Say it ain’t so! Since March, 2009, the US stock market has experienced incredible growth. Earning an average annualized return of around 13%, it has appreciated from the low of around 750 to the recent all-time high of 2941. During this nearly 10 year period, the S&P 500 has not had one calendar year where the returns were negative. It has only had one drop of more than 15%, which typically happens every three years. And it has not had a drop of 20% at all, which occurs on average every 6 years. Christmas is a celebration of the greatest gift ever given to mankind, Jesus Christ. For as the angel said to the shepherds “Fear not, for behold, I bring you good news of great joy that will be for all the people. For unto you is born this day in the city of David a Savior, who is Christ the Lord” (Luke 2:10-11). As Saint Paul would later say, “For the wages of sin is death, but the free gift of God is eternal life in Christ Jesus our Lord.” What a great gift! Whether or not someone accepts this as true, the story itself is one of immense generosity. And is it in that spirit that people all over the world today exchange gifts at Christmas time. It is a season for giving, receiving, and demonstrating love for one another. Of course, the story of an infinite God giving an infinite gift of grace to us is beautifully poetic. From the economies standpoint, the gift of increasing asset prices (particularly the US stock and real estate markets) have led to healthier retirement accounts, increased home equity, and a general sense that Americans are better off. After nearly 10 years of always Christmas, we are feeling pretty jolly. The gift of the Savior is free and could not be repaid even if someone desired to do so. The gift of asset appreciation over the past decade, however, isn’t so free. The Federal Reserve Bank has driven up asset prices primarily through suppressing interest rates. Instead of letting the free market determine how best to allocate assets, the FED thinks it can do a better job. Rather than moderate the business cycle, all it does is create more volatile and destructive credit cycles. Pushing down interest rates artificially allows individuals, corporations, and the government itself to take on more debt and buy more things. This has the direct effect of raising prices in various areas of the economy (i.e. create bubbles). Over the past 10 years, this US stock market has benefited from this appreciation. This has given many people the false sense of increased wealth. It is false because this gift of asset appreciation is temporary. And this prolonged winter-less Christmas is setting us up for what could be a long Christmas-less winter. Because of the bubble in US equities, many investors hold nearly all US stock funds or individual stocks. They have a few different individual stocks, or a few different stock funds, and think they are diversified. Unfortunately, this sort of diversification is like thinking that a balanced diet consists of different kinds of pizza. It may give you a false sense of security, but it isn’t going to do your health any favors. True diversification is a much less satisfying road in times like these. Real diversification never ”works’ in the midst of bubbles. Eventually, however, bubbles pop and the inevitable mean-reversion occurs across all the various asset classes. When that happens, diversification becomes a precious gift to those who have it. 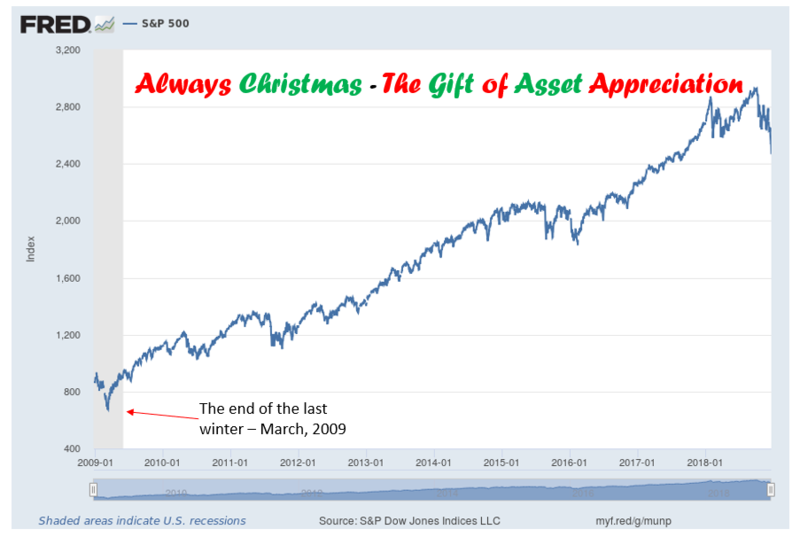 This is why the greatest challenge in investing is not following the bubble chasers through a long warm, Christmas and into an even longer Christmas-less winter. The coming of winter, then, doesn’t have to be a somber affair. Unlike Narnia, economic winters can bring gifts of their own. We give our clients the gift of global diversification, driven by value investing. While recessions are certainly difficult in some ways, they also reveal wonderful opportunities for growth in others. And as we look forward, there are plenty of places in this world where Mr. Tumnus could justify not wearing a shirt. Previous Previous post: Halloween May Be Gone, But The Zombies Are Still Here!